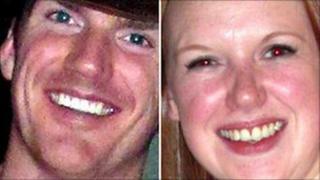 Police have asked a woman who may have information about a crash, in which a Royal Marine and his sister died, to get back in touch. Captain Michael Strachan, 28, from 45 Commando near Arbroath, and Doctor Maia Strachan, 26, died on the B979 in Aberdeenshire on 17 November. Grampian Police said an anonymous caller contacted them after the original appeal. The woman said she was from Inverurie and police want to hear from her again. Insp Ian Kirkwood said: "A lady telephoned our service centre during the evening of 19 November. "The caller declined to give her details, however I would ask that she gets in touch again on 0845 600 5700 and give us the opportunity to speak with her as she may have information which I think will be helpful to the enquiry." Police said the dark grey TVR sports car involved in the single-vehicle crash was "distinctive". The Royal Marine, who lived in Glasgow, married two weeks before the crash, and his sister, who lived in Edinburgh, was due to get married in February, having just got engaged. Relatives, of Milltimber, said in a statement: "Miai and Mike were the most amazing brother and sister."